Smoked rockfish (front) and tesa with egg. OK, I confess: Comedy is not my calling. Eating, however, is one of my talents, and so on Saturday night the gang (James, Zandra, J and I) ventured into Southeast Portland’s industrial district for a feast at Olympic Provisions. Turns out the restaurant’s name was not derived from the 12 Greek Olympians as I had fantasized. “Food of the gods,” and so forth. Rather, the restaurant is named for its warehouse home, the landmark Olympic Mills Commerce Center located next to the tracks, in the shadow of the I-5 freeway. Inside, the industrial feel endures with cement floors, subway tiles, dark wood-topped tables and exposed light bulbs dangling from rustic cords. Iron-and-wood shelving showcases a variety of wines and pickled items. A deli case displays salami for sale along with mounds of chicken and potato salad, with old-school meat-counter price cards — you know, the kind with the exchangeable red numbers. For drinks, we started off with a slightly effervescent rosado from the Basque region of Spain on the recommendation of our server. Her enthusiasm in describing wines and their origins proved her passion for the topic. We were in very good hands as she paired wines with our courses as we explored the menu. The menu itself is a smallish affair, belying the big flavors it foretells. The list of small plates is divided into small bites (olives, pickles, etc. ), vegetables, meat, and charcuterie. We started with the chef’s choice charcuterie (salami, pork rillettes, a terrine) alongside house-pickled veggies. An early standout was the silky, not-too-dense chicken liver pate spread on crostini and topped with shaved ribbons of sweet asparagus, to which Zandra declared, “I could have ordered 10 of those and called it good.” Amen, sister. But variety is the name of the game here, so like the feasting Olympians we strive to be, we ventured deeper into the menu: fork-tender squid in a brothy, sop-worthy harissa; chicken thigh, smoked sausage and delicately tender beef tongue in an herbaceous salsa verde broth redolent of mint; crisp roasted tesa (pork belly) atop pea shoots, all crowned by a fried egg, dissolved deliciously on the tongue; deeply smoky rockfish came served alongside fried potato squares and topped with a creamy horseradish sauce — the dishes kept coming. Finally the dessert menu appeared, from which we ordered a trio of cheeses and a sticky, delicious caramel walnut tart. Nearly too stuffed to leave, we sipped our port and dessert wine and looked back on the meal we just devoured. Food fit for gods, indeed, but certainly no laughing matter. Chicken liver pate and asparagus ribbons. Beef tongue that melts in the mouth. Sauteed spring greens and egg. 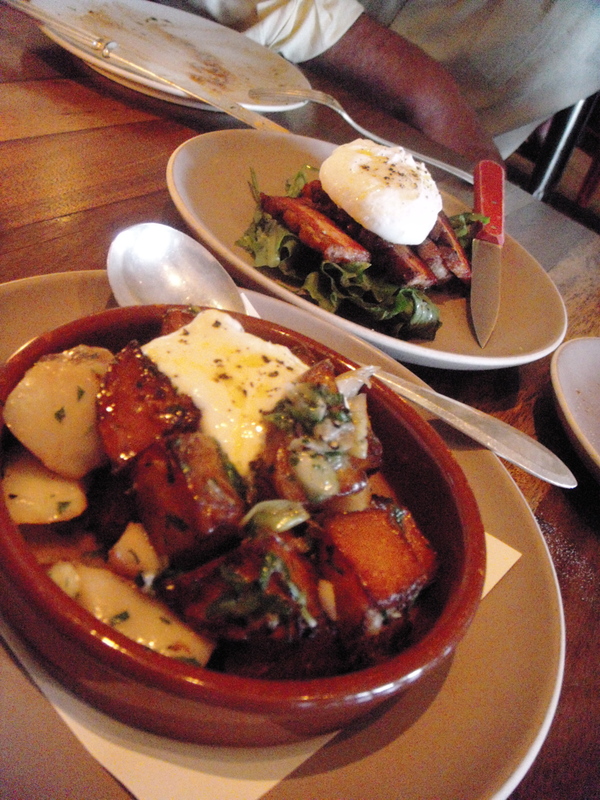 Poached egg spilling over roasted tesa. I’m all over the poached egg and spring greens. In fact, put a poached egg on almost anything and I’m happy. I might pass on the beef tongue, maybe if you called it something else like…rapalata. Oh, Julia, say it isn’t so! Beef tongue is so delicious. Very mild and not at all gamey as you might expect. Have you had tacos de lengua? Mmmm. Someday we will have to give you some rapalata … you will find it delectable.